Peter Nyamukusa is Chief Technical Officer for SimbaNET responsible for the Group’s Technology under the iSAT, Alldean Satellite Networks, SimbaNET and Wananchi Telecom Brands. 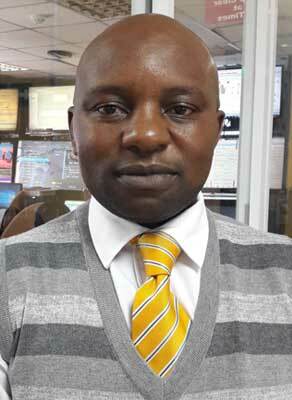 He Joined SimbaNET Tanzania in April 2010 as Technical Manager and rose up the position of CTO. Prior to joining the group, he worked for Africa Online as Group Head, Networks responsible for the Groups IP/MPLS and network expansion Strategy just before its merger with Afsat to form iWay Africa. Peter has 20 Years of Industry experience and is a Certified Telecommunications Network Specialist (CTNS), Certified Fiber Optic Design Specialist (CFOS/D. He also holds a City & Guild UK Technical Diploma in Micro Computer Technology and Advanced Diploma in Business Management & Administration as well as multiple professional Certifications such as CFOT, Prince2 Project Management, Microsoft MCSE & MCSA-messaging, Cisco CCNP, CCIP, CCDP, CCVP, CCIE–Theory, Juniper JNCIS Routing/Switching and Security, Cyberoam CCNSP & CCNSE, Fortinet NSE, Global VSAT Forum GVF-VSAT Certified and CASS WiMAX Certified.